Lucinda Maine, a 1985 graduate of the College of Pharmacy’s Kellogg Pharmaceutical Clinical Scientist Ph.D. program, has been selected to receive the University of Minnesota Alumni Service Award. The award recognizes her service to the college and the University, and to the profession of pharmacy. U of M President Eric Kaler will confer the award at the Alumni Association’s gala celebratory event during Homecoming Week on Oct. 19. 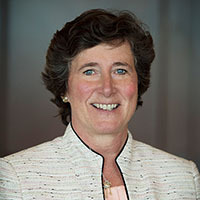 Maine has been executive vice president and CEO of the American Association of Colleges of Pharmacy since 2002. In this role, she leads the organization that provides leadership in advancing and enhancing the quality of education and training in its 140-plus member institutions. Under her leadership, the organization has helped elevate the level and utility of the pharmacist degree to new highs. Previously, she held several senior VP positions over a 10-year period at the American Pharmacists Association, the national organization for all pharmacists. She also served as associate dean and director of professional relations at Samford University School of Pharmacy.